Until 1925, General Motors ('GM') assembled trucks in Brazil from parts manufactured at their Canadian works. This enabled them to import vehicles into Britain under Imperial Preference, which favoured products from the British Empire as far as import duties were concerned. Such trucks were marketed as "British Chevrolet". In 1925, GM took ownership of Vauxhall Motors, production was transferred from Hendon to Luton, Vauxhall's headquarters, production commencing there in 1929. The AC and LQ models were produced at Luton from 1929 to 1931, and styled as the "Chevrolet Bedford", taking the name from the county town of Bedfordshire, in which Luton is located. The AC was bodied as a light van (12 cwt), and the LQ in a wide variety of roles, including a lorry, ambulance, van and bus versions. The name "Chevrolet" was dropped, and the first "Bedford" was produced in April 1931. This vehicle, a 2 ton lorry, was virtually indistinguishable from its LQ Chevrolet predecessor, apart from detail styling of the radiator, and was available as the WHG with a 10 feet 11 inches (3,330 mm) wheelbase, or as the WLG with a longer wheelbase of 13 feet 1 inch (3,990 mm). However, the Chevrolet LQ and AC continued in production alongside the new product for a further year. In August 1931, a bus chassis was added to the range, and was designated WHB and WLB. A large part of Bedford's original success in breaking into the UK and British Empire markets lay in the overhead valve (OHV) six cylinder Chevrolet engine, now known as Chevrolet Stove Bolt 6 � well ahead of its time, this smooth running inline six cylinder engine was to form the basis of Bedford and Vauxhall petrol engines almost until the marque ceased building trucks and buses. Bedford introduced the 3 ton WT series in November 1933. Again, a short wheelbase WHT (9 feet 3 inches (2,820 mm)), or long wheelbase WLG (13 feet 1 inch (3,990 mm)) version was offered. A change in design of the WLG produced the WTL, with its cab, internal combustion engine and radiator moved forward to allow a 14 feet (4.3 m) bodylength. In 1935, the WTB bus version appeared, and the WS and VYC models were updated � the latter being redesignated BYC as it was fitted with the engine and synchromesh gearbox of the Big Six Vauxhall cars. The 5-6 cwt. HC light van was introduced in 1938, based on the Vauxhall Ten car, and the WT and WS acquired a newly styled grill. Mid 1939 saw a complete revamp of Bedfords; with only the HC van continuing in production. The new range consisted of the K (30-40 cwt), MS and ML (2-3 ton), OS and OL (3-4 ton), OS/40 and OL/40 (5 ton) series, and the OB bus. Also on offer was a new 10-12 cwt van, the JC, derived from the new J Model Vauxhall car. Many of the trucks sold by Bedford between June and September 1939 were requisitioned for military use on the outbreak of World War II; many were abandoned after the retreat from Dunkirk, rendered useless to the enemy by removing the engine oil drain plug and running the engine. Because the German armed forces in 1940 were, contrary to their popular image, desperately short of motor transport, many of these captured Bedfords were repaired and pressed into service alongside Opel Blitz (also part of GM) trucks by the German armed forces � although the Bedfords mainly filled second line roles, including civil defence. In 1935, Bedford began the development of a 15 cwt truck for the British War Office. This entered service as the MW in 1939, and 65,995 examples had been built by the end of World War II in 1945. The MW appeared in a bewildering range of roles, as a water tanker, general duties truck, personnel carrier, petrol tanker, wireless truck and Anti-Aircraft gun tractor - among others. The War Office designated 15 cwt vehicles such as the MW as trucks, and larger vehicles as lorries. The 1939 K-, M-, and O-series lorries were quickly redesigned for military use. This was largely a matter of styling, involving a sloping bonnet with a flat front with headlights incorporated and a crash bar to protect the radiator in a minor collision. The military versions were designated OX and OY series, and again were put to a wide range of tasks, including mobile canteens, tankers, general purpose lorries, and a version with a Tasker semi-trailer used by the Royal Air Force to transport dismantled or damaged aircraft. This variant was popularly known as the "Queen Mary". A number of Bedford OXD 1.5 ton chassis were converted to make the Bedford OXA armoured vehicle. A total of 72,385 OY and 24,429 OX lorries were built. The Armadillo was an OY fitted for airfield defence with Lewis guns and an ex-aircraft COW 37 mm gun. A radical departure from Bedford's design norms came in October 1939, with the development of a four-wheel drive, forward control lorry, which entered service in March 1941 as the QL, quickly nicknamed the "Queen Lizzie". As with the MW and OY / OX models, the QL went on to serve in a large number of roles, such as artillery tractor, gun porter, command vehicle, wireless lorry and petrol tanker, as well as the troop-carrying QLD, the most common variant. An experimental version used the track unit of a bren gun carrier, or Universal Carrier, as an answer to the German half-track vehicles, which had superior cross country capacity. Production ran at around 12,000 units per year between 1942 and 1944. Many QLs and other Bedford World War II military vehicles served with the British Army, and other forces into the 1960s, and many others were purchased for civilian use after the war. After the evacuation of Dunkirk in June 1940, the British Army had around 100 tanks, most of which were obsolete and inferior to the German tanks of the day. Vauxhall Motors was given one year to design and produce a suitable heavy tank. In May 1941, the Churchill tank went into production at Luton, some 5,640 units and 2,000 spare engines being produced at Luton, and other sites under contract to Vauxhall. The resultant need to continue truck production brought about the development of the new Bedford Dunstable plant, which came online in 1942. Apart from vehicle manufacture during World War II, Vauxhall Motors produced steel helmets, rocket bodies, and top-secret components for Frank Whittle's jet engine. The HC 5-6 cwt van continued briefly after the war, and the JC 10-12 cwt was fitted with the column gear change; and engine from the Vauxhall L Model Wyvern in late 1948; and became the PC. 1952 saw the launch of the Bedford CA light commercial, a range of vans and pick-ups similar in concept and size to (although pre-dating) the Ford Transit of 1965. These were semi-forward control, having a short bonnet with the rear of the engine protruding into the cab. Engines were the Vauxhall-based 1,508 cubic centimetres (92.0 cu in) OHV in-line four petrol engine, with the option of a Perkins 4/99 diesel engine later on. Performance was adequate for the time, a maximum speed of 60 miles per hour (97 km/h) being attainable with the petrol engine, and offering fuel economy of 25 miles per imperial gallon (11 L/100 km; 21 mpg-US). The van initially featured a three-speed column gearchange, changing later on to a four-speed column change. The CA was a huge seller both at home and in various overseas markets. The standard panel van was available in short- and long-wheelbase forms, and was also sold as chassis cab / chassis cowl, and became a popular basis for ice-cream vans, ambulances and camper vans. Known affectionately as "the Tilley", the CA enjoyed a very long production span, with only minor tweaks throughout its life, including the replacement of the two piece windscreen of earlier models with a single sheet, Production ended in 1969. The CA was replaced by the CF, a completely unrelated vehicle using new overhead camshaft (OHC) engines, which was to have a much harder time proving itself thanks to the Ford Transit. The 1950s also saw the launch of the popular S type trucks, the so-called Big Bedfords, which brought Bedford into the 7 ton range. The S series was immortalised in RL form � a four-wheel drive, high ground clearance version, as the "Green Goddess" emergency fire tender, managed by the British Army, and until recently, still used in the event of fire-service industrial action or serious emergencies as of the 21st century. As part of a rationalisation, large quantities of Green Goddesses have, as of 2008, been earmarked for withdrawal, and offered for sale within the private sector. Several have found new homes in African countries that lack a developed fire-fighting service, such as Kenya. These vehicles were available in rigid and tractor units, with either petrol or diesel engines. The UK military were a huge customer for Bedford RLs using a 4.9 litre straight six petrol engine. Many RLs found their way into the armed forces of Commonwealth countries and later into civilian use. The pre-war K, M and O types continued in production alongside the heavier S types until 1953. Vauxhall had already gone for a transatlantic styling with its E Model Wyvern and Velox saloons, and Bedford followed suit with its mid-range of trucks in 1953. Designated as the TA series, the new range were mechanically very similar to their predecessors, but featured a new Chevrolet-inspired cab. The 'T' designation meant "truck", so the range is generally referred to as the A series. Numbers 2, 3, 4 and 5; as in A2, etc., identified the weight rating. A factory-fitted Perkins diesel engine was an option. The TA (A) series was updated in 1957, and became the TJ, or J series. The C series of 1957 was a forward-control derivative of the S series, and outwardly very similar to it. 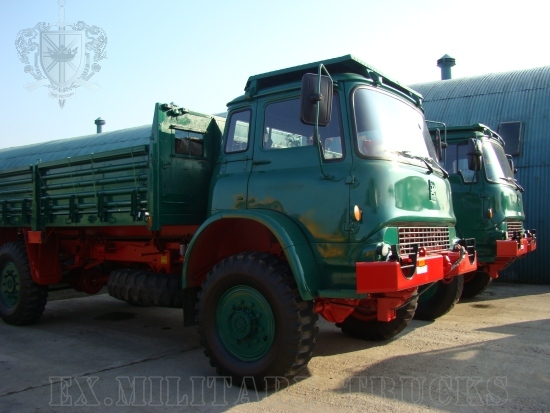 The Bedford TK range was produced in large numbers since 1959, and served as the basis for a variety of derivatives including fire engines, military vehicles, horse-boxes, tippers, flat-bed trucks, and other specialist utility vehicles. A British Post Office (later British Telecom) version used for installing telegraph poles was known as the "Polecat". The British Armed Forces still use four-wheel drive Bedford MKs � a variant of the TK. Available with four- and six cylinder petrol and diesel engines, the TK was the quintessential light truck in the UK through most of the 1960s and 1970s, competing with the similar Ford D series. It was available in rigid form, and also as a light tractor unit, normally using the Scammel coupling form of trailer attachment. The Bedford KM was a similar vehicle, using the same cab, but with a slightly restyled front end, and was marketed for heavier-duty applications than the TK, i.e. 16 tons and over. Many developing countries still use ageing Bedfords every day, their robust nature and simple engineering endearing them as highly useful vehicles in demanding terrain. During the period 1961 to 1968, General Motors Argentina manufactured Bedford trucks and buses (based on a truck) in a plant at San Martin. In 1967, a Bedford SB3 chassis with Plaxton's Panorama cab was used in the construction of seven custom mobile cinema units that toured British factories for the Ministry of Technology to 'raise standards'. The body was custom fabricated from extruded aluminium by Coventry Steel Caravans. One of these units remains in preservation, and is to be used as a vintage mobile cinema. The smaller Bedford CF was less successful, competing directly with the market-dominating Ford Transit, although used by many of Britain's major utility companies, including British Telecom and British Gas plc. However, the CF was much less popular with fleet operators than the Transit, which was more popular with its drivers and seen as cheaper to operate and maintain. Part of the reason for the CF's relative unpopularity was the use of the slant 4 SOHC petrol engine from the FD and FE Vauxhall Victor - which was notoriously rough running, had high fuel consumption, and was susceptible to cam belt breakage. However, the CF became very popular as a base of special bodied ice cream vans and mobile shops. The later CF2 used the more reliable Opel Ascona engine. Bedford's smallest products, car-derived vans, were the Bedford HA van, which substantially outlived the Vauxhall Viva HA on which it was based, and the Bedford Chevanne, a short-lived variant of the Vauxhall Chevette. An estate conversion of the HA van by Martin Walter was marketed as the Bedford Beagle. This was further developed into a camper van, the Roma, again by Martin Walter. The company also made a number of bus chassis, its low price catering for the cheaper end of the coach market. The TK range was joined and eventually largely replaced by a number of models: the TL range most directly replaced the TK, beginning in the early 1980s. It was never as popular as the model range it succeeded. The Bedford TM was the largest of all the modern Bedfords, with payloads available up to 42 tonnes GTW permissible. A major blow came when Bedford failed to win the UK Ministry of Defence contract to produce the standard 4 ton 4x4 GS (general service) truck for the British forces, although in extensive tests the Bedford candidate had performed equally to the Leyland (later Leyland-DAF) candidate, and the British Army expressed a preference to continue the trusted relationship with Bedford trucks. The reasons for this decision were seen by many as political, as the Army 4 tonner contract was seen by the Thatcher government as essential for the long term survival of Leyland, and the formation of Leyland-DAF. The implications of the decision were also noted by GM in Detroit, who had already been refused permission to buy the Land-Rover division of British Leyland, which they had intended to operate in tandem with the Bedford Truck division as a major force a military and civilian 4x4 market. In addition to this devastating blow, by the middle of the decade, cheaper and more technologically advanced competition from other truck manufacturers overseas, and a general contraction of the truck market proved too much, and Bedford withdrew from the heavy vehicle sector. From there on in, Bedford concentrated on smaller light commercials only with the CF model, and finally the Bedford Midi � later to be called the Vauxhall Midi. In 1986, the Bedford van factory in Luton was reorganised as a joint venture with Isuzu. The resulting company, IBC Vehicles (Isuzu Bedford Company Ltd), produced a European version of the Isuzu MU Wizard called the Frontera, and a range of Renault-designed vans sold under the Vauxhall and Opel brand names. The Bedford name was dropped completely, as were all of its preceding range apart from the Midi, which was sold for a few years as the Bedford Seta. The Bedford trucks site in Dunstable and business was sold in 1987 to AWD Ltd, a company owned by David John Bowes Brown. The AWD name was used as GM would only allow the use of the Bedford name for military trucks. David John Bowes Brown was the designer in 1973 of the then DJB D250 Articulated Dump Truck, built in Peterlee, England, by DJB Engineering Ltd.
DJB was renamed Artix in 1985 when the trucks were rebadged as Caterpillar. Artix itself was sold to Caterpillar in 1996. AWD continued with the TL and TM range. The AWD Bedford TK (a rebadged and modernised version of the Bedford TK / MK range) was also produced and supplied to the British military. Due to cheaper competition and the virtual collapse of the UK market in which AWD competed in 1989/90, the company went into receivership in 1992 and was bought by dealer network Marshall of Cambridge. There remain around 7,000 Bedford and AWD vehicles in service with the British military. Bedford used the Griffin logo of Vauxhall Motors, derived from the heraldic crest of Fulk le Breante, who was granted the Manor of Luton by King John. By marriage, he acquired property in London, known as Fulk's Hall, which over time, came to be the locality of Vauxhall, the original home of Vauxhall Motors. The griffin returned to Luton in 1903 when Vauxhall Motors moved there.